We are turning 50! To help us celebrate our anniversary, a huge team from all over the world has worked together to create worship resources for your church. When we started meeting, we realized there was creative energy for not just one Sunday, but 5 Sundays, thus creating a 5-week anniversary worship series intended to start 7 October 2018! 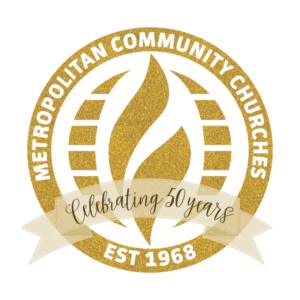 This five-week worship series loosely follows the five decades of MCC history. We explore the ideas, movements, and topics that have created our identity: Open Table, Love, Justice, Hope, and Faith. In this resource kit, you will find more readings, prayers, and ideas than can possibly be used each week. Our hope is that you review these materials and create a worship service that fits your context. We’ve also included ideas from some of our emerging churches that engaging in worship in different ways. Consider adopting these ideas into your context as well. We have intentionally released these resources so you can have five months to prepare. Please note, some resources have yet to be uploaded, but all resources will be available by 20 June. When anniversary time comes, we encourage you to film or photograph part of your worship service and share it with the larger MCC community. You do not need fancy equipment, a simple phone camera will work! Take a video of the call to worship, an original song, a prayer, a dramatized version of a scripture reading; photograph art, the altar, the creative response time. Post these on the Clergy/Lay Leader page on Facebook and use #Celebrate50 or email them to [email protected] so everyone can see your congregation! This is just the start of 50th Anniversary materials for your community to celebrate MCC’s Anniversary! Watch for more information to come next month, including a resource for Home Gatherings (small group storytelling worship services). And, don’t forget to promote and participate in MCC’s Let Your Light Shine Campaign!